So this is the reason I keep books on my shelves for years! 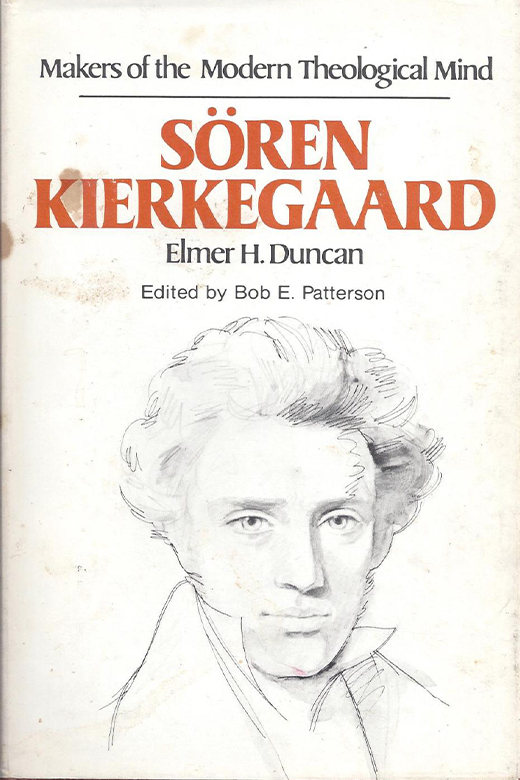 Elmer Duncan's Soren Kierkegaard, is one of thirteen volumes of the Makers of the Modern Theological Mind series. I bought it more than thirty years ago, and with the exception of an occasional move or dusting of the shelves, it has sat with its lonely cohort mostly out of sight and out of mind. Until Gordon Marino got me thinking about Kierkegaard while reading Marino's readable and insightful, The Existentialist's Survival Guide: How to Live Authentically in an Inauthentic Age. In chapter two, "Depression and Despair," Marino references Kierkegaard's Either/Or, and The Sickness unto Death. But it was Marino's reference to Kierkegaard's concept of "three sorts of selves" that piqued my curiosity and turned on the light above that quiet volume sitting on my shelf. Duncan's book has been helpful to me. He sketches Kierkegaard's life (1813-1855), showing the profound influence of his father (which Marino also cites). He also contextualizes Kierkegaard's work by locating the philosopher/theologian/poet in the context of Kant (1724-1804), Hegel (1770-1831), and Sarte (1905-1980). Do I "get" Kierkegaard? Well . . . much better than I did. I've come to appreciate the difference between aesthetics and ethics in a Hegelian and Kierkegaardian discussion. It makes sense and gives meaning to Kierkegaard's title, Either/Or. In an earlier day I would have criticized Kierkegaard's "Leap of faith." But that is because I did not understand it in it's philosophical and theological context. I understand it better now. In fact, I will use it. As Sarte noted, "man's existence precedes his essence." That means we can and must choose. I chose to read Duncan's work. I am glad I did.